As we all know, Black Friday is the one day of the year that prices are unbelievably slashed down. And the toys we usually want but won’t buy at regular prices are the Apple gadgets. They’re just too expensive sometimes. Anyway, Apple is, in light of the Black Friday tradition and the start of the Holiday shopping season, slashing down the prices of some of its most wanted gadgets. However, there are no discounts for the most waned Apple gadgets, iPhone and MacBook Air. iMac: The three high-range versions have been discounted $101, the low-end has been discounted $51. MacBook: The two new 13-inch versions are both $101 off, the older 13-inch (white) version is $51 off (making it $948). iPod touch: All versions are $21 off — this makes the 8 GB version only $208. iPod classic: Both versions are getting $21 off. Apple TV: Both versions are now $21 cheaper — this makes the entry level version $208. The discounts may not be much but it’s good enough. 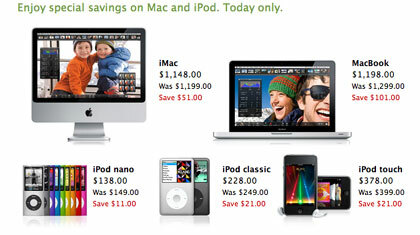 Apple produts on sale are available through Apple stores, Apple online stores and even at retailers. AppleInsider has a tabulated price chart of the Apple gadgets available on different online stores.